The county’s first-ever mainstream awards seeking to celebrate pinnacle members of the ethnic minority community in Dorset are being held at Bournemouth International Centre. To mark its twenty-fifth anniversary, Bournemouth International Centre's 2019 wedding show and exhibition is to relaunch, in partnership with Archant, as Bride: The Wedding Show at Bournemouth International Centre. The UK’s first and biggest touring gin festival is returning to Bournemouth from 4-5 May 2018. Bournemouth International Centre is to feature at this year’s International Confex, the leading exhibition for event planners, in a bid to attract even more business events, conferences and exhibitions to the south coast. Following a successful event in 2010, the Association for Palliative Medicine is returning to Bournemouth with its annual conference. The Association of Inner Wheels Clubs in GB&I, one of the UK's largest women's voluntary organisations, returns to Bournemouth for its annual conference 19-21 March 2018. A succession of new events, conferences, expos and festivals are set to take place this year at Bournemouth International Centre and Bournemouth Pavilion, attracting thousands of visitors, industry professionals and delegates to the south coast. 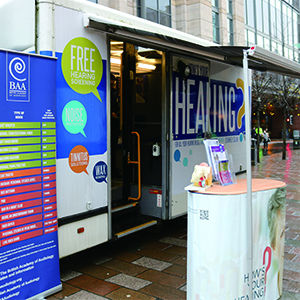 The British Academy of Audiology (BAA) has teamed up with Starkey Hearing Technologies to provide free hearing and ear health screenings for all at The Triangle, Bournemouth on Tuesday 14 November 2017 from 10am-2pm.